With rapid urbanization of all the existing cities and development of new cities in certain parts of the world, it has become utmost important to create good urban spaces. Spaces that are used to the optimum level economically, that do not harm the environment, and are attractive and pleasing to the pedestrians and other users. This study delves into the area of urban design and environmental psychology to find out relationships between the physical aspects of street and the reaction of the pedestrians to those physical aspects. 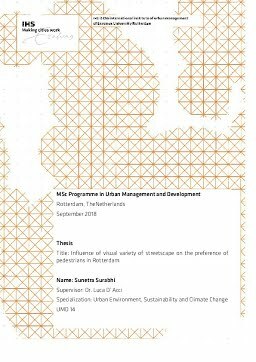 The main aim of this research is to understand the relationship between urban design qualities together with visual complexity on the visual preference of the pedestrians for the streets or Rotterdam. Relationship between visual complexity and preference has been studied by various researchers by employing fractal dimension as a measurement of visual complexity. The relationship between urban design quality and visual preference has also been explored earlier but this research based on the extensive study done by Ewing and Handy (2009) in which they have operationalized subjective urban design qualities through measurable physical characteristics of streets. Thus these characteristics have been studied and rated to come down to single number representing urban quality of each street. Visual complexity has been computed by taking out the fractal dimension of each street using binary images of those streets. For the visual quality perception, a preference survey was carried out and 100 responses were taken for each street. The statistical correlation and regression between fractal dimension and preference of pedestrians revealed significant positive relationship. It also confirms the research by Cooper and Oskrochi, (2010) to find significant positive relationship between fractal dimension and visual preference. Urban design measurement was then qualitatively compared with the fractal dimension and preference of each street. It was then established that those streets that had scored higher in urban design qualities had also scored higher in fractal dimension and were preferred more than the other streets. This research can be taken forward by quantifying all the three variables using the same base data of static images or videos of the streets. Urban designers can use this study to employ fractal dimension as a tool to achieve attractive and vibrant streets.